wheremmsgather: I'm Your Teapot Tuesday Challenge Hostess! Dusty's owners grew up and left home. Found in the attic he has suffered some moth damage. Could you love him? Once upon a time there was a sweet, adorable teddy bear named Dusty. Dusty lived in Detroit with his owner Daphne, who loved Dusty very, very much when she was a little girl. Daphne took good care of Dusty, too. Always making sure he was fed, bathed, changed, and toted around with her everywhere she went. Daphne always made sure that Dusty was in her arms when her mother and father tucked her into bed at night, too. His most favorite time with Daphne was their daily tea parties. Dusty loved Daphne and was such a happy teddy bear. Then, one sad day, Daphne didn’t come to visit Dusty, nor did she come the following day. A week went by and Dusty despaired of ever seeing Daphne again. Shortly thereafter, Daphne’s mother, Delphine, relegated Dusty to the attic where he remained for many, many years gathering dust and losing his downy soft fur to the dastardly moths in the attic. Dusty cried and cried and so wished that Daphne would come rescue him from the darkness of the attic. He was so alone and afraid. A few months later, Dusty saw a moving truck pull into the driveway. Despondently he watched as Daphne’s father, Darrin, and her mother, Delphine directed the movers as to which items should be removed from the house. Dusty was so hopeful that they wouldn’t forget about him all alone in the attic, but, alas, they never came for Dusty. Dusty watched as the last piece of furniture was loaded onto the truck and Daphne, Darrin and Delphine loaded up in the car to follow the moving truck to their new home. Hearing of Dusty’s sad tale, I, Bertie, am calling upon all my card making tea party friends to help save Dusty and give this sad story a happy ending. I know what wonderful, big hearts you have. Come to Michigan and pick me up along your way to Detroit where we are going to rescue Dusty! Be sure to bring food, clothing, storybooks, extra teddy bears, your sewing kits to help repair the tears in Dusty’s fur, and whatever else you think Dusty may need and let’s show him how much we love him by finding a new home for him! Dusty will be joining us for high tea, and Bertie's bringing m&ms with Dusty's face and name on them. As you can see from my card, Dusty has been dusted off and his tattered fur repaired. He's also been given a new bow tie and a heart full of love because he is in his new home nestled under the Christmas tree, as one of the presents to be given to a new little girl who will love and cherish him. This is also for my Doubledog Dare Challenge (DDC) on two counts: (1) as issued by Francie last week to make a card with four or more layers and use ribbon and/or cord and (2) as issued by me as a doubledog dare to my DDC group to participate in this week's Teapot Tuesday challenge! Oh Charlene! This is just so beautiful!! Love the pretty little Christmas scene you created!! Whoohoo!!!! Charlene is the hostess with the mostess...on 2 challenges...you go girl!!!! I love your little Dusty card and am sooo glad you were able to spiffy him up a little!!! I will start packing now...got a whole bag of M's for ya!!! I'll pick you up in the morning...now to dream about tea potters, bears, and M&M's!!! I was hoping Cindy was OK - I know she always schedules her posts, so 8 am our time up the TPT pops. When it wasn't there this morning, I was hoping all was well with Cindy...and then I move on down Google Reader and find Dusty's sad saga. Reminds me of my little koala who once got lost up in a tree in the garden. It was at least a year or more before I found him, and patched him up with sheepskin ears and fur from a muff. Admittedly he'd already lost most of his claws, and by then his eyes were jet beads, but he was still worth repairing and playing with -so I'm all up for restoring Dusty :D.
Charlene! I am so happy to see you hosting this week. give our little Cindy a break, so she won't get too tired out huh. Well, I'm all for that. Your story could be a children's book story you know that right. I so love your card, it's vintage feel and all the beautiful colouring but...I love you more! I will be back to save our little Dusty friend shortly, you can count on me. now that is some story! a stunning teapot and an absolutely gorgeous card! Awww.... This card is darling Charlene. Great teapot as well. What a fabulous story and creation, Charlene! Thank you for hosting the teaparty this week. I'll have to put my thinking cap on and try to join in one evening this week. Well, Charlene, your timing on this couldn't have been more on the spot...I had just set out a big lawn leaf bag full of DD's stuffed animals to give to charity today...the only way I could do that is they weren't from us, but past boyfriends...and I got their permission first. I am hoping they will go to some child who will love and play with them and give them much happiness. I love this story, it reminds me of my favorite Christmas book, The Velveteen Rabbit!! I can play tomorrow or maybe tonight, today was busy with dr. appts. Thanks for the sweet story and the smile it gave me, and for taking on the challenge this week. Your card and story are both so very touching!!! How adorable Charlene!! LOVE this sweet little scene you've created!! Your ornaments and packages are just super charming! And I love your angled ribbon!! What a beauty!! THANKS so much for hosting! Tuesdays are not the same without a teapot challenge! 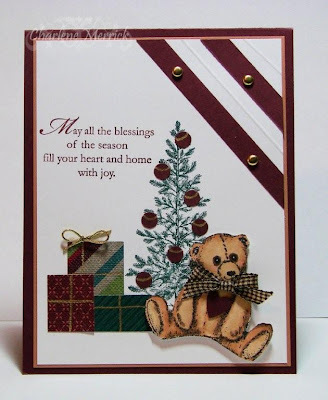 Beautiful card and great story! Got our creative juices cooking! Outstanding design and scene! Wonderful Christimas card. Your card is GORGEOUS Charlene, I love it. This is such a stunning card Charlene!!! I just love your sweet Teddy and your layout (especially the diagonals on the corner). Gorgeous Christmas card!! Trying to catch up my fav blogs. First stop and so glad...what an absolutely sweet story and an even sweeter card. I used to collect, make and sell teddy bears and I collected teapots as well so I'm a goner for this one. Hope I can get time to play today. Maybe Dusty would like a warm weather Christmas this year?